Comsats Internet Services has launched its Wi-Fi modems for DSL customers in Islamabad/Rawalpindi with a package called Freedom Broadband. This service is being offered in Islamabad and Rawalpindi at present and will be offered in more cities by the end of the year. Earlier, only PTCL and Link Dot Net were offering WiFi modems/routers for their customers. COMSATS’ Freedom Broadband package offers DSL service for both students and professionals including 512 kbps, 1 mbps, and 2 mbps. I have been using COMSATS for the last one year. 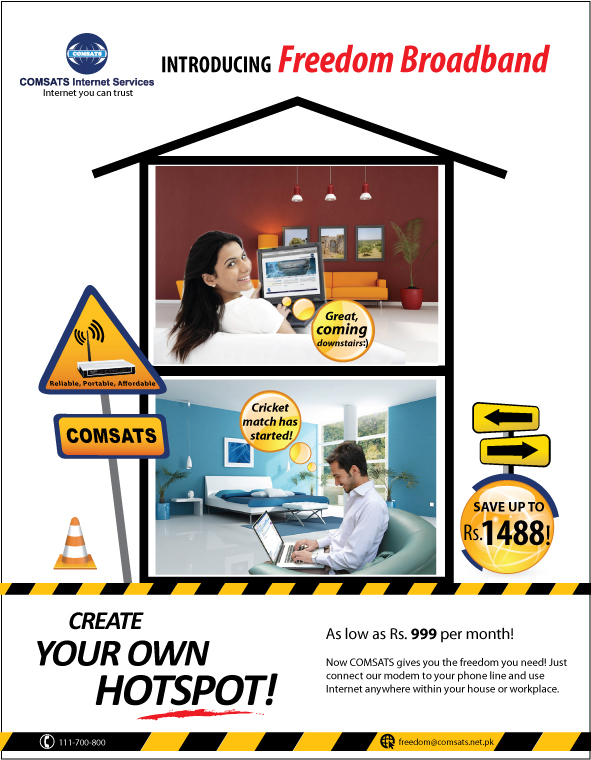 This is a nice offering from COMSATS in the sense that they are offering 6-month and 1-year broadband packages also. There are no modem charges but security is refundable on return of modem. COMSATS provides good customer support on weekends also. Didn’t even knew their name in Broadband providers. what the hell! Whats this monthly charges are for? Such greedy tricks make the useful stuff in limited hands. For Rs 5000-7000 a Linksys N band wireless router can be purchased and owned for life and its one of the top quality one. In UK, broadband service provides the wireless routers free with no deposit asked but as soon as contract finishes, it needs to be returned. I don’t understand why these people don’t use such method even having the cheapest world market in their side. Ah ok.. *misread* there are no charges! Apologize. That is good efforts indeed! they still cannot compete ptcl..what the refundable security is for? ptcl and link dot net, both do not charge it. @shk, if you had read the first post carefully, it says that security is refunded on modem’s return. Hence, it is money that customer will get back eventually. 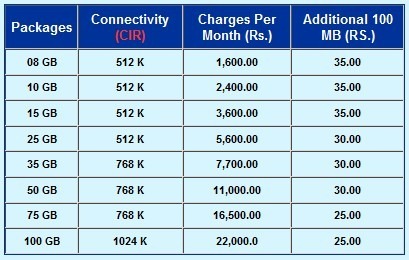 BTW, I compared and COMSATS rates are 50 rupees per month less than PTCL’s wifi dsl. Also, installation charges are half of ptcl. Plus their customer support is much better than Ptcl! When will they start their service in Karachi? The best DSL Services for Islamabad/Rawalpindi are MICRONET(dsl.net.pk). I live in a far area of RWP with my home being 12 km from CANTT Exchange. Despite this I get a full 1 mbps speed at day and an average speed of 1.9 mbps between 8 pm to 8 am and Sundays. As far is a wireless router is concerned one can simply get a cheap TP-Link device for Rs. 1500. AH! COMSATS Pioneer ISP of Pakistan Great, I think ISP’s upgrade their services and coverage time to time, COMSATS launches Wifi DSL only i cant believe it. 512KBPS for Rs.999/- as student package is very bad decision. while other ISP’s like linkdotnet and PTCL are offering 1mbps with same rate and wifi modems, so why to go for COMSATS only for customer support for home user. PTCL charges 1399/month + 500 in installation charges for 1 mbps wifi dsl. I paid 250 for installation and 1350 for monthly. Hence, COMSATS is cheaper. Plus their customer support is very responsive. its really expensive packages …. wateen is the on the lowest one.. so dont come in lahore !!! hehe better purchase your own wifi modem.